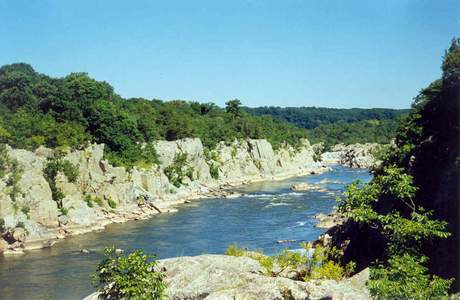 Description: This is a moderate 4 mile hike minutes from the hustle and bustle of our nation’s capitol. It’s a great place to take the family and for beginners to develop their “hiking legs”. For a place so close to a major metropolis there is so much …. wild power and natural beauty here as you watch the Potomac force its way through the rocky crags of Great Falls and the narrows just above Mather’s Gorge. As you walk along you can witness extreme sports firsthand, White Water Kayaking and Rock Climbing, and at the same time study the micro-ecosystems of the never ending vernal pools scattered along Billy Goat Trail. On the return leg you can take in the history of the canal. All of this power and beauty has its price: crowds. 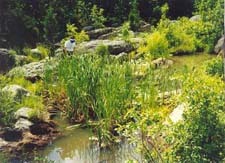 Since the C&O Canal runs straight through the middle of the park any reasonably suitable day for being outdoors will bring throngs of walkers, hikers, joggers and bikers to the park. Try to get there early. Then, at least, you’ll only have to deal with the crowds as you walk along the towpath back to your cars. Note: I classify this hike as being moderate but those with balance problems and other certain phobias may have issues with this hike. I won’t go into a detailed explanation but will just say that the trail’s name was aptly applied. Bring extra water and sun protection as much of the hike is exposed to the direct rays of the sun. Our canine friends are not allowed on Olmsted Island or Billy Goat A Trail so Rover will have to sit this one out. Violators will be ticketed and may be ejected from the park. 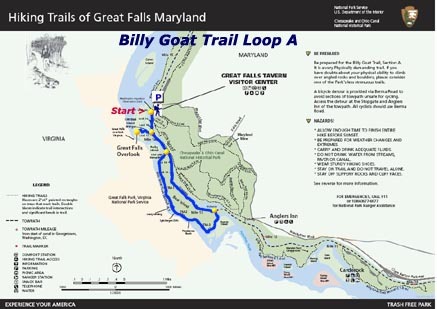 For a longer, more challenging trek combine this with all or part of the Billy Goat Trail - Section B and C Circuit. Trail Notes by Ken Clark, Howard County, MD Sierra Club: From the Tavern Visitor Center, cross the canal on a footbridge over the middle of lock 20. If you time it right, you may get a demonstration of the lock operation. You are now on the canal towpath. Note the sign about how many people drown here due to the dangerous water currents. Turn right and go a short distance to a view of the river, from on top of the intake of the Washington Aqueduct. A low dam crosses the river here to divert water into the aqueduct. Return back down the towpath and continue on past locks 20, 19, and 18. On your right, the Olmsted Island trail takes you out to see the falls. Everything in the Potomac River is Maryland, including the islands, but that's Virginia you see on the other shore. 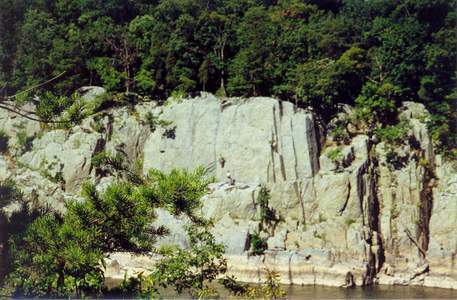 You'll see an observation platform over there, near the Great Falls, VA Visitor Center (see Difficult Run Loop). Return back to the towpath and turn right. Another quarter mile takes you to the beginning of the Billy Goat A Trail, on your right just before the Stop Gate Bridge. The sign says that this section is only1.7 miles long, but you can easily spend two hours enjoying this trail. Follow the blue blazes, found on trees as you start, but often on the rocks as the trail continues. 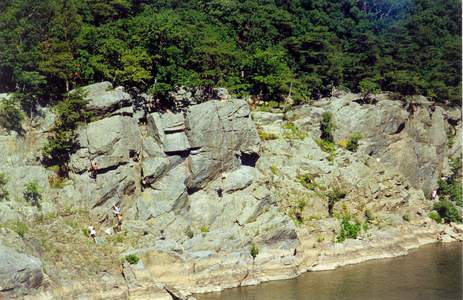 Check out the various views of Mather Gorge, kayakers, and rock climbers on the Virginia side. Also inspect the numerous little pools and ponds, where you can find frogs, tadpoles, turtles, spotted newts, and snakes (mostly northern water snakes). At one point, the trail goes down to the river and then cuts up a diagonal crack in a rock face. It looks a little intimidating from the bottom, but really isn't too bad. When you come to Trail Marker 2, if you've had enough rocks you can take the emergency exit trail back to the towpath. If you're still having fun, continue following the blue blazes over more rock scrambles and beaches. Eventually the trail veers away from the river and ends at the towpath. Turn left onto the tow path and follow it back to your cars. Outing Critique: For the past year or so I have been coming to this trail and running it a couple times a week, all 4 seasons. It is great exercise and makes trail running more interesting/fun with the intermittent rock scrambles. During the summer remember your Camelbak, etc. Also, the trail is nearly always busy (unless you're running it at 7AM in January!! ), but folks are pretty relaxed when you politely say "excuse me" and pass them. One thing I will say is that the trail is not nearly as "difficult" as the NPS warning, so even if you're nervous about going or haven't done any hiking, don't let it stop you. Just go for it! It is really beautiful and fun, whether you're taking it slowly as a beginner or running it regularly. Wear trail shoes or athletic shoes with good grip and you will be totally fine! Critique: I love this trail. The views are beautiful along the Potomac river, especially early in the season when the meltwater still has the river running high and fast. The best times to go are weekdays or late afternoon on a weekend, provided you know how much time you take on the trail and how much daylight you have left. There are many places where the rocks are intimidating, especially if you are afraid of heights (like I am). In most instances though, it's easier to jump from rock to rock than it is try to climb around them. Wear good boots and it's no problem. I regularly complete this trail in less than an hour, a little more if I stop to look at everything. It's pretty much my favorite place in the entire DC area and worth the effort. Critique: I thought I would add my critique. As a person with multiple (read 15) knee surgeries and currently in knees braces, and multiple foot surgeries, I was a little nervous going into this hike due to the rocky surfaces and inclines. It was for good reason. If you have legitimate lower joint, back, or neck issues this hike will be very difficult for you. However, it is doable. I made it. I am sore but am functional. It was beautiful and offered great views not available from other vistas or sites. My advice is to know your limits. I am young and active and I am headed to total knee replacement anyway so my boundaries are a bit loose. If you know your body cannot handle inclines, rocky terrain and climbing this is not the hike for you. Critique: went on Sunday morning at 11 am so we did run into 3-4 other groups of hikers but it was by no means crowded. Good light warm ups on the tow path and small rock scrambles. The one larger climb up the rock face was a lot of fun and at that point we were definitely glad to have other hikers' input. We left back to the towpath at trail marker 2 so overall took about 1 hr 15 min. Great easier hike with a good mix of light hiking and fun rock climbing! Critique: Best strenuous hike near D.C. I would say that so long as you don't have balance problems and/or a fear of heights, anyone should be able to do this hike. Caveat- it is all in how fast you want to do it. For a real challenge try running it- with the understanding that there will be some areas where you'll have to slow down (the rock scrambling sections). I give it a 4 simply because it can get crowded- though I have been there plenty of times when it's not. My recommendation- pay the $5 to get into the park and hike it North to South. Why- you get to hit the rock wall as a climb rather than a descent- much more fun and challenging to see how fast you can get up it. Watch for snakes- I have run across black snakes and copperheads on and near the trail- leave them alone though and they will leave you alone too. Critique: We loved it. I couldn't have done this 30 pound ago, and before I started running though. Its pretty difficult, and we turned around when we got to the very difficult rocks, didn't make it to the traverse, but my 5 year old said it was "awesome" and wants to go back soon! Critique: I am not a frequent hiker and just moved to the area. I was originally put off trying trail A by the NPS warnings that this is a "demanding" hike. I decided to try it anyway presuming that this was some over the top legal team writing this stuff. It is. There are kids as young as 10 or 11 on this trail. As long as you are comfortable walking over boulders you will be just fine. Good shoes a must. Posting in case anyone else has any doubts. Winter appears to be the best time to go, it was very quiet and i maybe ran into 20 people over the entire loop. Doing this in summer seems like it would just be miserable - the number of locations you are likely to run into substantial bottlenecks are too many to count. Go in winter, bring good shoes. Critique: I thought this trail was amazing. I'm not sure I would say it was for beginners. It has some steep declines/inclines on rocks and it would be challenging for beginners. I loved every minute of it. You would never even know that you were near a city and a crazy beltway. The views are gorgeous. It's a perfect day. I highly recommend this hike and can't wait to do it again. Critique: I hiked the BGT-A with my daughter's 4th grade class. Now mind you playing in the rough outdoors was something I have not done since I was in the fourth grade. So i took a step out side the box. (** wondering why I was the only parent in attendance**) As we started the kids were excited and full of energy, so I was feeling the same. As we entered the trail, I was saying what a piece of cake this was. But I spoke to soon, me being a regular of the local gym I figured this would be a long walk with minimal climbing. Boy was I wrong, as we got further into the trail I realized I bit off more than i could chew. The cliffs and the climb up the diagonal summit (which I consider a mountain since its the biggest thing I have ever climbed) had me praying and swearing at the same time. Once to the top I felt I could accomplish anything, and I did I completed BGT-A without any broken bones or scars and I kept up with a bunch of fourth graders. This was a great experience and my daughter and I plan to go back and walk more trails. Doing this brought out a side in me I did not know existed and I had fun. ("Now just paying for it in Pain"....LOL) I will return. Critique: I have to give BGT-A a 3 because of the high volume of human traffic. I like peace and solitude on my hikes (too much to ask for so close to D.C.), and the endless parade of boy scouts, cub scouts and hiking clubs made this a noisy hike, to say the least. The trail itself is an exciting one, and Mike is right: hikers with balance problems - of whom I am one - should come prepared. It's full of places that require hopping from one narrow boulder ledge to another, and several deep, water-filled potholes that must be gotten around along ledges. I went up the cliff, which seemed easier than going down (to begin the hike so you'll approach the rock face from its base rather than summit, begin the hike at the trail head closest to the Park's entrance). It is a rather shear rock face, but foot holds are fairly easy. The next time I hike the BGT-A will have to be on a weekday. Critique: It is a great trail but some people are intimidated by the Traverse (the cliff in the middle). It is a very heavily used trail, so the park encourages people to stay on the marked footpath and not venture into the middle of the island. 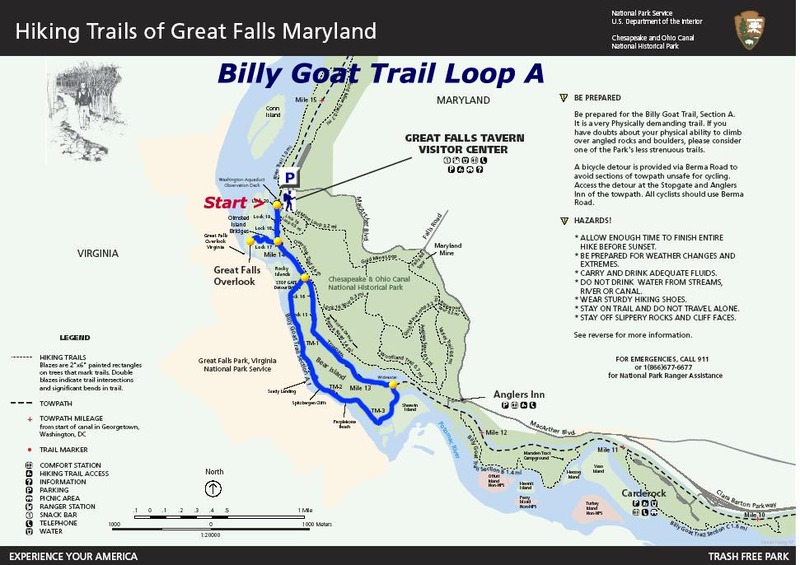 Also they like to encourage people to also visit Billy Goat Trails B and C. The B section is just down stream from Angler's Inn, the C section from Carderock. Sorry to be 'that guy', but the reason dogs are banned from the Billy Goat Trail Section A is because it is such a heavily used trail and they tend to get in the way. Also it is on an island (Bear Island) and the presence of dogs freaks out the animals and they don't really have any place to go. Despite people saying how well behaved their fido is, I have seen them chasing animals and getting into fights with other dogs. Not to mention they are tick magnets. People with dogs that can't handle the traverse or other rocky parts of the trail tend to make their own path through the middle of the habitat, which doesn't help with the whole animals on an island thing. Dogs are allowed on Sections B and C, which are much more suited for them I think. 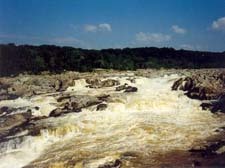 Critique: This was the second hike I have done in the DC area and decided to do the MD side of the Great Falls Park. I found the C&O Trail area very interesting and well maintained and loved the Billy Goad Trail! It was very challenging for me (I'm still way out of shape at this point) but the 1.7 mi route across the rocks was so engaging that I didn't notice how tired it made me until I was walking back to the start point on the tow path. Overall, it's just absolutely beautiful. Since the $5 entrance fee from the VA side was valid for this side (3 day pass) it was a free hike on this day. There are more Billy Goat trails that are south of this loop and I intend to explore them next. This is a true treasure for somewhere so close to the DC metro area. Critique: I highly enjoyed this hike. While Section A is only 1.7 miles long, it feels much longer. I only started doing day hikes during this summer, and though I have done trails at least twice as long as Billy Goat Section A, I found this hike to be especially exhausting. Don't get me wrong... it's the best kind of exhausting I've ever experienced! You really feel like you've accomplished something. The endless spectacular views and the rock scrambling/climbing made the trail one of the most diverse and exciting trails I've hiked, and at times I felt that I had been transported away from Maryland to somewhere out West! I highly recommend this trail for beginners who, like I, have had some experience on a couple of moderate trails under their belt and want to experience something more exciting than just an endless green tunnel.